A 17-year-old German student contends PayPal has denied him a reward for finding a vulnerability in its website. Robert Kugler said he notified PayPal of the vulnerability on May 19. He said he was informed by email that because he is under 18 years old, he did not qualify for its Bug Bounty Program. He will turn 18 next March. PayPal, which is owned by auction site eBay, outlines the terms and conditions for its Bug Bounty Program on its website, but does not appear to have an age guideline. PayPal officials did not have an immediate comment. Many companies such as Google and Facebook have reward programs. The programs are intended to create an incentive for researchers to privately report issues and allow vendors to release fixes before hackers take advantage of flaws. Facebook pays a minimum of US$500 for qualifying bugs, while Google pays from $100 up to $20,000 depending on the severity of the issue. Neither has an age restriction listed on their websites. Microsoft does not pay for security vulnerability information, but instead publicly acknowledges the work. PayPal does not list what it will pay a researcher for a bug. Kugler is listed as a contributor in a Microsoft list from April of security researchers. He said he received rewards for finding vulnerabilities in the past. Mozilla paid him US$1,500 for finding a problem in the Firefox browser last year and $3,000 earlier this year for another bug. 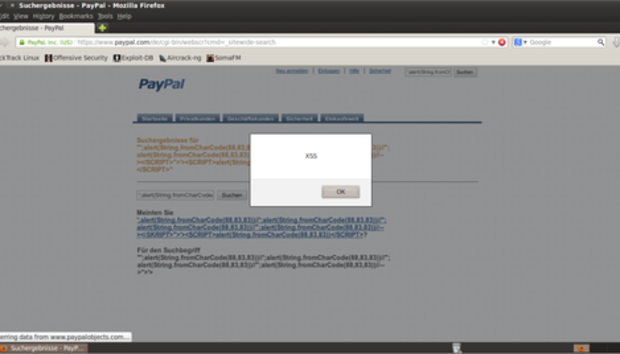 PayPal requires that those reporting bugs have a verified PayPal account. Kugler said he asked PayPal that any bounty be paid into his parent's account. At minimum, Kugler would like PayPal to acknowledge his finding and send him some documentation "that I can use in a job application," he wrote via email. So far, he hasn't received anything. The details of the vulnerability, a cross-site scripting flaw (XSS), is posted on Full Disclosure section Seclists.org, a forum for disclosing security vulnerabilities. An XSS attack occurs when a script drawn from another Web site is allowed to run but should not. The type of flaw can be used to steal information or potentially cause other malicious code to run.